Fitness is a Family Affair | Committed. We had ants in our pants this weekend. Kiddo was running wild, definitely restless, and DEFINITELY not up for sitting in the bike trailer for an hour while mommy and daddy went for a joyride to get some exercise. So. We did a family workout instead. I’ll admit it, that even though I often feel like being lazy, I LOVE exercising. I made a plan, based on the tiny park layout. There was a bench, and some cement ball sculpturey things, and a small lawn to work with. We brought one set of 10-lb weights, my phone with an interval timer app, an exercise mat, water, and towels (and some snacks for the kiddo). Failure to plan is planning to fail…or somesuch. Part of the plan was to have mommy and daddy doing different activities that would allow us to engage our daughter, or at least watch her while we worked out. Let me tell you, kids love frog jumps. I HATE them. But they work. Toward the end, she got sick of not being the center of attention. So I got a little extra ballast for the last few exercises! 30 more pounds for step ups? Sure! A lap buddy for triceps dips? Bring it! She got a kick out of doing mountain climbers under me (I used the bench to make them a little easier, she thought it was funny). And we got to do some fun stretches together. She actually said (without prompting): “Exercise is FUN!” which made me so happy. I mean, she liked me bouncing her around on my lap, but still. It’s a positive association and I’ll take it. If they get bored, get them involved! Step-ups are much more challenging! What’s my point? That getting fit can be a family affair. If you’re on your own and don’t have childcare, try taking them with you. (I say this because I have one child–I don’t know how I’d do with 2 or more!). Here’s the workout. Please ask me or look up any of the moves if they don’t make sense to you. DON’T GET INJURED! 90 seconds each. Do all 4 exercises of the group without rest. Rest 30-60 seconds between groups. Be sure to warm up for a few minutes before starting. Step ups with knee up, 10-lb weight in standing hand. Shoulder press as you rise. Pause at the top. 45 seconds on each leg. Toe touches (squat, touch the ground, stand up, reach to the sky). Go fast! Quick stepup/downs on a bench or step. Lunges with bicep curls, alternating legs. Can do this walking or stationary. Cool down and stretch well! Although they may not know it, these people have been hugely influential in my quest for health (especially after having a baby). Please “like” their Facebook pages and enjoy their motivational posts! 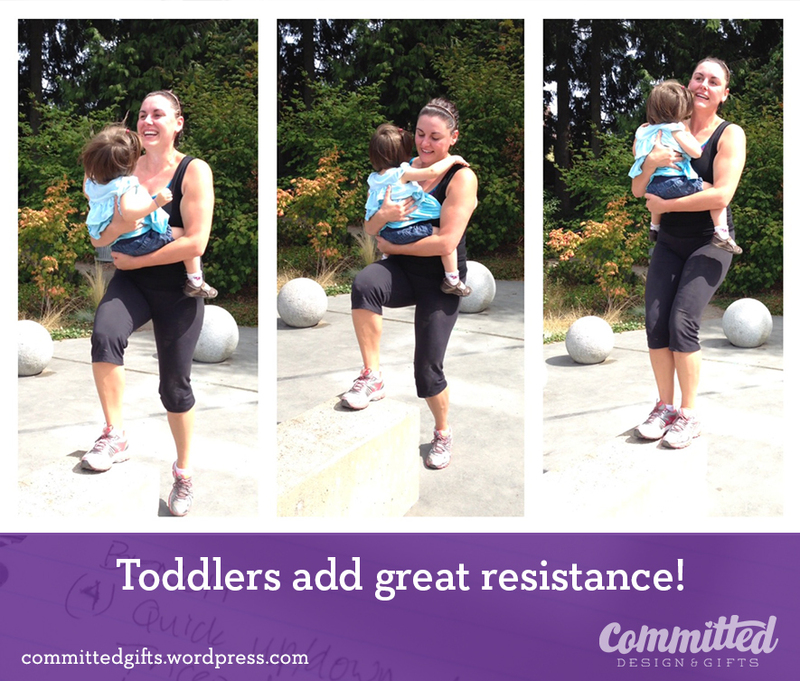 Fit4Mom West Seattle: When I was battling postpartum health issues and working hard back toward health, this group of mamas was so inspiring and helpful. They got me out of the house and MOVING, and showed me that exercise and motherhood didn’t need to be mutually exclusive. EvoFit: These 2 moms are AMAZING trainers. I love their motivational posts and humor. BFit Bellevue: amazing cross-training facility. You get an even better workout than with a trainer, but in a supportive group setting. I’ve done things in just a few classes that I never thought I’d be able to do. Still can’t do the one-leg hop ups…yet. 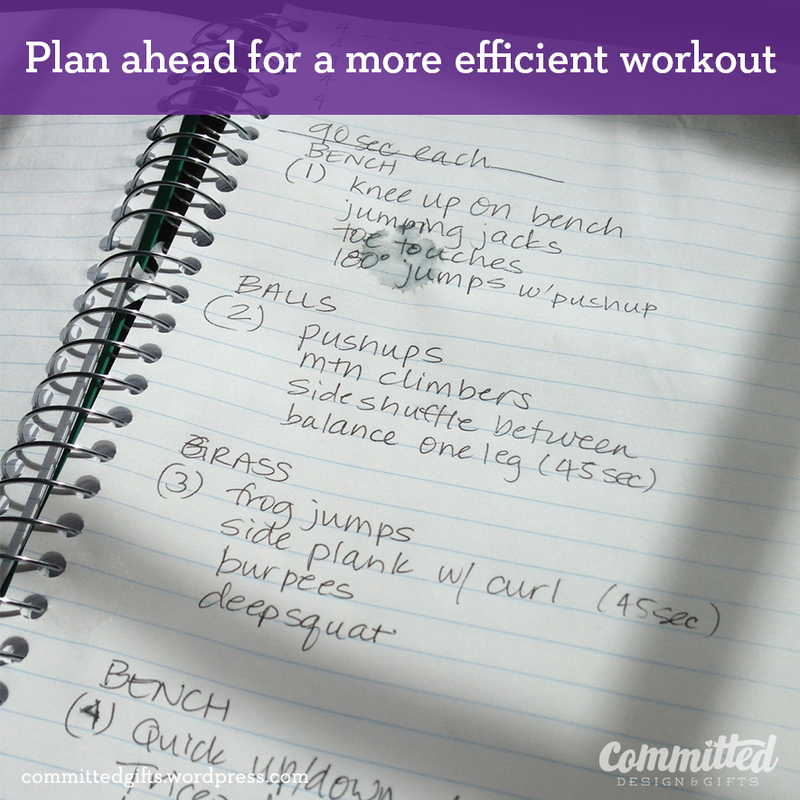 What are some of your favorite workouts? How did you get healthy after kids? Pingback: Maintain, Don’t Gain Holiday Challenge 2013 | Committed. Pingback: A Pain in the Neck: Scarf Storage | Committed.